How much should we spend on tradeshows? Should we spend more on search engine optimization, or pay-per-click? Are webinars worth the cost? That may not be something you often hear from an expert, but it's the best short answer I can honestly offer. I don't know which specific programs will be cost-effective for your business and which ones you should eliminate, but I do know how to figure out the answer. I've actually managed marketing for a company that sold to a handful of large mobile phone makers: we didn't need to generate leads at all. Lead generation programs would have been a waste of money, so we focused exclusively on building market awareness and sales support tools. Track the number of leads, qualified opportunities and wins generated by each program. Then use the overall cost of the program to calculate the cost per each lead, cost per opportunity and cost per win. There are certainly flaws in this method - notably in designating a single program as the appropriate source for a particular prospect - but it's better than guessing. A prerequisite for measurement is an agreement between sales and marketing on the precise definition of a "lead," a "qualified opportunity," and a "win." Further, they should agree on a process for moving prospects from marketing over to sales. Marketing's dumping unqualified leads onto sales is a sure way to waste money, besides creating ill will all around. Know how many leads are required to generate one qualified opportunity, and know how many qualified opportunities are required to generate one win. Once you know these "conversion ratios," you can figure out precisely what's needed to make each stage of the sale process productive. You won't pay for leads you don't need, or sales people you can't feed. Understanding the funnel can also help you identify where prospects are getting stuck. A low yield of leads-to-opportunities requires a different fix than a low yield of opportunities-to-wins. Most SaaS companies will find that their customer acquisition costs (sales & marketing) will account for the single largest portion of their expenses. 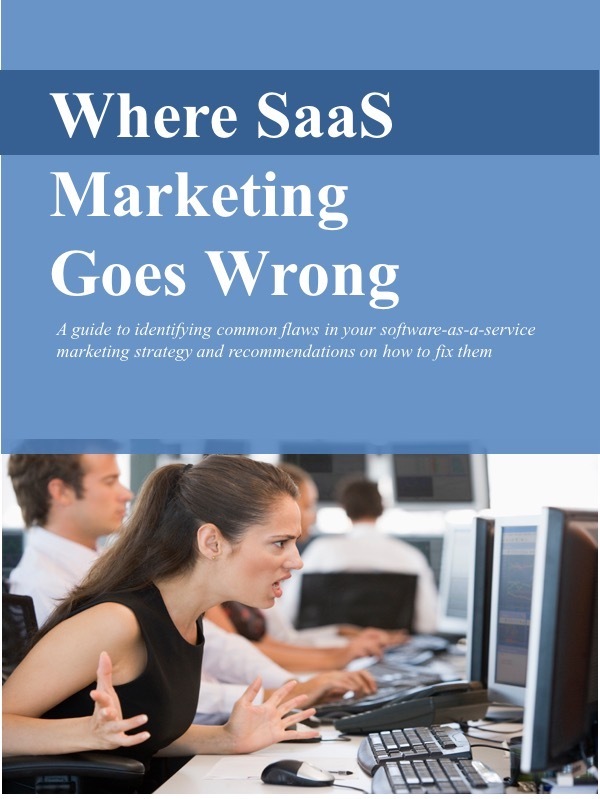 And under the SaaS business, sales and marketing expenses can often exceed one-third of subscription revenues. There is no margin for wasteful spending. (See "Hyper-Spending on Customer Acquisition: The Wile E. Coyote Effect." Though I wish it might be otherwise, I don't believe there is an easy answer on how to cut your customer acquisition costs. Or least not an easy answer that's accurate. As H.L. Mencken put it, "There is always an easy solution to every human problem - neat, plausible and wrong." A race car driver who had just qualified for the first time for the Indianapolis 500 explained to me the most difficult part of navigating the 2.5 mile circuit: keeping the accelerator pushed to the floor. He said it's easy to do while driving down the straightaway; the tough part is when you're heading into the 90-degree turn at the end. If you lift the pedal, the car won't turn left in front of the concrete wall at turn one. A quick lesson on race car aerodynamics. Indy Cars are designed like aircraft wings, only upside-down. In a plane, the faster it goes, the more lift is generated to carry it up into the air. Indy Cars, by contrast, need to stay on the ground, not fly into the air. They are designed so that the faster the car goes, the more downforce is generated to hold it onto the track. Not enough speed means not enough downforce, means the car leaves the track surface, means the driver can't steer, means... you get the idea. Marketing software-as-a-service (SaaS) solutions is a lot like driving an Indy Car. Of course, those subscription revenues are recognized over the entire lifetime of the customer, often over several years. However, the sales and marketing costs are recognized immediately. You spend now to earn later. According to this formula, the faster you spend, the more short-term losses you generate. As you're racing down this straightaway, running up big deficits, one instinct is to lift off the accelerator. Radically cut spending on sales and marketing. After all, these are probably the largest single expense items on your income statement. (I've shown how much publicly-held SaaS companies are spending at "The Risk of Spending Too Little on SaaS Marketing.") It's an instinct perhaps learned from experience with the business model for on-premise applications. But if you've built an efficient sales and marketing machine, lifting the accelerator is exactly the wrong thing to do. If your finely-tuned customer acquisition machine is yielding $3, $4, $8 for every $1 in sales and marketing spend, keep the pedal to the floor. If you cut back on spending, you lose visibility in the market, you can't generate prospects, and you can't support your sales efforts. The result: you can't acquire customers, and you'll fall further behind competitors until you're no longer a viable choice. You'll lose revenue in the short term, and you'll lose revenue over the long term. Then you're unable to fund product development, customer support, and operations, so you lose your existing customers. You may save cash by cutting expenses, but at the same time you've lost market traction. Like an under-steering Indy car heading toward turn one, the business slides into a drift, and at least figuratively, hits the wall. Of course, keeping your foot on the sales and marketing accelerator requires enough fuel, in the form of capital, to stay in the race until the lifetime customer revenues come in over time. And it requires a well-tuned, efficient customer acquisition machine. But it also requires courage. No doubt, the notion of accumulating big short-term losses is downright scary. Maybe not quite as scary as heading toward a reinforced concrete barrier at 220 miles-per-hour, but scary nonetheless.